* EUROS €30 or UK£25 or *US$40 or YEN ¥3567 for each additional block of 5000. Over 30,000 will be rounded to the nearest 5000. (i.e. 26,735 will be rounded to 25,000. 28,650 will be rounded to 30,000). * To calculate population served take 5% of your legal service area and apply this number to the corresponding population range. Access is normally given within 72 hrs following payment of subscription fee. Due to uploading operations, the website may not be available on alternate weekends (Saturdays and Sundays with reference to (GMT-06:00) Central Time, USA and Canada). 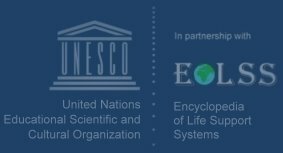 The EOLSS is an integrated compendium of Twenty One Encyclopedias, regarded as the largest on-line publication carrying knowledge for our times. It is a virtual , dynamic library equivalent to about 600 volumes, peer reviewed body of state-of-the-art archival knowledge edited by over 395 subject experts with contributions from over 8000 reputed authors from more than 100 countries.